Jack Boyd has never been great at making friends, but over the next few months he’ll be meeting a lot of interesting people. The next 180 days won’t be just a mad dash for money. Jack will need to keep up his police work too. He’ll send his cops out to handle situations, he’ll coordinate action on scene, monitor the progress of key investigations, oversee the budget, hire and fire – every day, it’s dozens of key decisions that affect countless lives. Even just regular cop business poses lots of problems: a drunken patrolman might gun down a bystander while he’s aiming for an unarmed bully. And it’s not just the staff, it’s the increasingly crazy orders from the mayor's office – not to mention the press and their uncomfortable questions. It’s all a part of life as a police chief. This is only one part of Freeburg, the most prosperous area. Some areas are so challenging that even the most experienced and gritty cops hesitate to go in. You can either ignore or fulfill the orders that come from the mayor's office. Either way, there’s bound to be consequences. Jack doesn’t always play it safe, and his actions affect all those around him. The corrupt mayor has been at his throat – and it’s him who sent the retirement memo as soon as Jack turned 60. Freeburg is a great town, but it has its crime problems. There’s major civil unrest brewing, people in conflict, struggling for power. There’s criminal gangs and cartels fighting for territory, businessmen, trade unions, and the church fighting for influence. And the authorities fight for the right to rob the rest of them with impunity. Your employees like to party, sometimes even the night before their shift begins. If an employee comes in with a hangover, you can fine them and send them home, but some of them just can’t seem to get enough. Freeburg has its share of criminal gangs, but Jack doesn’t always catch them. You can love the police, you can hate the police, but you can’t argue that the police wield enormous power. Each major step Jack takes will shift the established order of things. On your words hang many of the city’s most powerful forces. You can’t win without compromise; you’ll have to find friends somewhere. But who you’re fighting can change every day. If you finish the game broke and out of work, don’t feel too bad – you might have ended the game in prison, or with a bullet in your guts. The success of any operation hinges on which personnel you send. Is This Is the Police similar to other games? Partly. To some extent it is a strategy game: you have an array of forces with various attributes, who you send on a variety of missions across the city map. 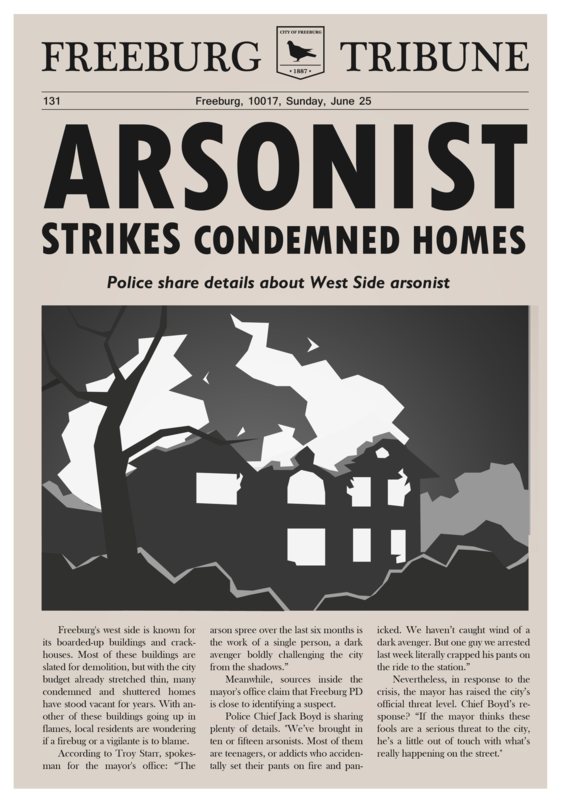 But at the same time it’s an adventure game, and an interactive novel: you get to investigate the relationships between the characters, handle press conferences, and encounter various crimes across a wide range of scenarios. This is also partly a tycoon game, since a lot of the game is tied to money. You’ll want to keep an eye out for new avenues of income, and keep your books – the official and unofficial. There’s a variety of game mechanics, and which parts play the dominant role will depend on many factors: your style of play, the decisions you make, and sometimes on the particulars of the case you’re faced with. One day you'll be working the big cases, putting the real crooks behind bars. The next you might be outwitting a suspect, or breaking down a crime scene. There’s plenty of gameplay variation, but our chief task is to ensure that everything that happens on the screen is an important part of the overall story. You won’t get bogged down with the numbers and the attributes of your units, and it’s not just a set of puzzles to solve. As you move from one event to the next, the city of Freeburg will change around you, in response to your actions. The story is not constrained by a particular genre or narrative format, so you can truly take part in the life of a desperate man trying to regain his self-esteem – and you’ll never know how the story will evolve, just around the next turn. The press love Jack Boyd, because he tends to answer questions directly and openly. But recently things have been changing. Honestly, we don’t like Kickstarter campaigns that hit you with a huge wall of text. We didn’t want to overload you with an expansive document describing all the details. So, we tried to make it short and exciting, and share all the critical stuff. But we’re happy to share all the extra details, not just about gameplay, but also about the world and the characters in the game. 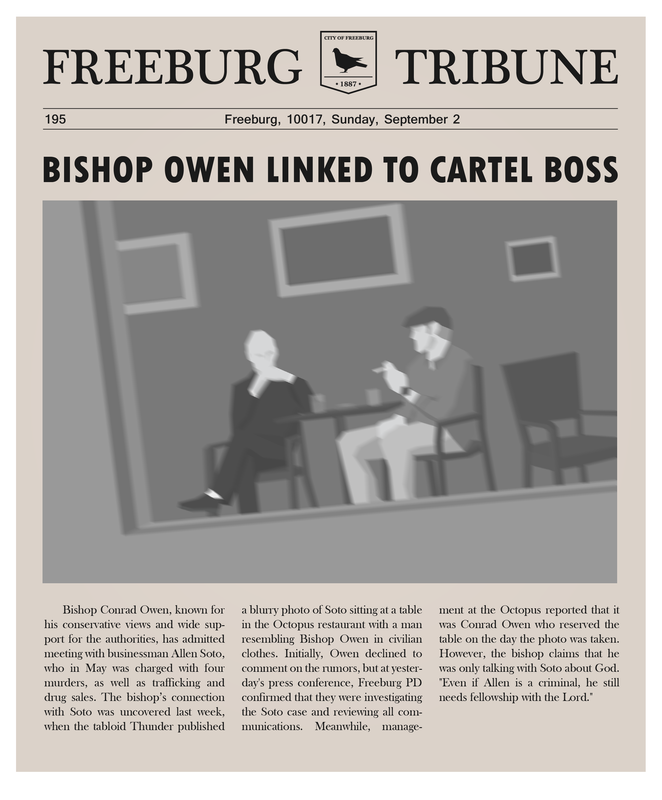 We’ve been thinking about how best to present this information, and we decided to create 10 issues of the Freeburg Tribune – one of the daily newspapers published in the fair city. The Tribune will tell you all about the events that are taking place across the town. We will publish one issue every time the campaign reaches another 10% of its goal. But we’re not limiting ourselves to the Tribune; we’ll have further announcements and explanations, so stay tuned! Of course we welcome your questions, and will try to answer them as quickly and fully as possible. The kiss of death has nothing to do with love. Over the next 180 days, Jack will put a lot of people behind bars. Some might even deserve it. * If we get into Steam, you can get a DRM-free copy of the game, and a Steam key as a gift. If we release console versions, you can also get a DRM-free copy of the PC version of the game, and a key for any platform you choose as a gift. Our team is quite experienced, having split our time between working in game studios, and in the gaming press. We understand the whole process of game development, and experience teaches that you simply can't foresee every obstacle. We’re ready for anything, but expect to be surprised: we’ll deal with any difficulty we face, planned or unplanned, and we’re ready to fight to the end. The path is not so long, and we’ve traveled on it before. There will be twists and turns, but we know that, with your help, in the end this will be a standout game. At present, This Is the Police employs 7 people. If the Kickstarter campaign is successful, we plan to complete the PC-version of the game by December 2015.